Sometimes we have to convince ourselves that it’s ok to hit PAUSE in the middle of living out our Passion! I’m not one to move in slow motion and I often struggle with pausing in the midst of things. I am grateful i have learned its ok to hit PAUSE. The passion i have is equally shared with my husband. When God created us for each other, He knew exactly what would break our hearts and make us cry together. He created our passions and knew just how we would work together to fulfill them. I am thankful that we chose to move into the life of Foster Care. It has been a piece of many, in our obedience to Him. It took time for us to recognize our passion, but after our awakening…He has supplied our every need to move forward. We strive to make a difference…one child of His at a time. Today, I look back on His goodness through each test, trial and phase we have been through as a family. We have received so much insight and growth through each and every situation we have faced. We are more than conqueror’s! I have been pushed in areas I never thought I’d go and used in ways that are of Him Alone! Excitedly, we have removed the PAUSE that has been in this area of our Passion! The Foster Care system desperately needs Christian families to share the love of Jesus. To share His love with the hurting child and to the child’s parents. (whenever that connection is available) His love can bring healing and restoration to the child as well as the family. The most important goal is for each one of them to be confident of their eternal future. We are aware that our family is far from perfect. If the Foster Care system only wanted perfection, there would be no system at all. We learn from every situation we encounter, continuously seeking the Lord for guidance in (all areas) of our life. God has given us much and we cannot help but to share what He has given. We knew we wouldn’t PAUSE our Passion forever. With that, we also know we will face more test and trials, hurts and painful loss. We will face the same emotions (and maybe some new) that have already been felt over the last 11 years as Foster/Adopt parents. When I reflect back on some of the hardest trials, the memories alone Should Make Me Fearful…but i know…we are NOT slaves to Fear! Our God is GREATER than ALL of our Fears and ALL of our Unknowns. Gods plan will never fail! It will forever remain perfect in our imperfect world of abuse and neglect. He will never stop pouring out His love. It pours over and through us in meeting whatever need is presented. It doesn’t make it easy. Doing God’s work is difficult. But He (and His Amazing Love) makes it possible! Fostering truly is the toughest job we’ve ever loved. Some of the healing and progress is never seen. Sometimes it’s a daily struggle to push through whatever mountain we are faced with. But we know that with Him we can do ALL things. He still moves mountains! It is by His strength alone that we overcome each obstacle along the way. We trust Him in the process for each outcome and we pray for wisdom as we embrace each child’s different needs. As we remove the PAUSE in our Passion we are taking another leap in our faith. We are confident in our provider of all things good. The PAUSE in our Passion came at the perfect time. We started as birth parents of two, a boy and a girl. Only God knew we’d become parents of an additional two boys and one girl through adoption. We chose to temporarily close our Foster home two years after our last adoption of our teenage son. I was apprehensive at first in doing so. (I didn’t want to stop helping other children because the need is WAY to great) But we knew through seeking God for guidance, that our PAUSE was in His perfect timing. During our families pause, we spent quality time focusing on each moment and on each other. (the good, the bad, the joyful, the painful, the accomplishments big and small) We spent time advocating and seeking out the resources needed to better equip our children and ourselves. At times we were extremely stretched in our faith. I became a pro at praying hard on my knees. And we learned to completely trust His plan when ours was shattered, or His was completely unknown. The PAUSE in our passion was needed. It’s ok for you to PAUSE in the midst of your passion too. Our PAUSE helped us to retrain, redirect, restore and finally…to refocus. To refocus on the passion He placed in us. In our family. 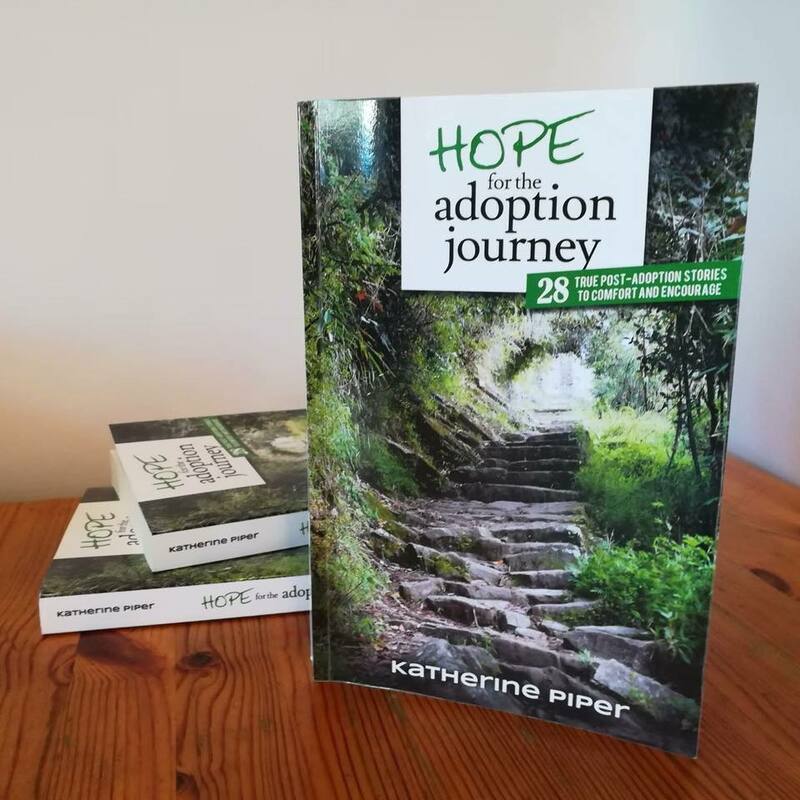 After eleven years, 22 children in our home, 6 that were transitioned into other forever homes, 1 reunited with her birth family, 3 that completed our hearts and family forever and…a three year PAUSE….our PAUSE has changed…but our Passion has not! Our license to offer Foster Care has been reinstated. We have transferred to the county in which we live and cannot wait to see what God has in store for us after taking our much needed time. We will be helping with emergency removal care and respite (relief for other foster parents) along with temporary or short term placements. We are excited to step forward again in our passion. Parenting, Recruiting, Mentoring, Training, Speaking and PRAYING the entire time…that the amazing Love of Jesus transforms lives through us. God has been right in the midst of our PAUSE. He continues to be in the midst of our future work in the Foster Care System. We continue to be an imperfect family, but we strive to love like Him. We are extremely excited to once again be a part of something much greater than ourselves. We are humbled and honored that He chooses to use us. Don’t hesitate to PAUSE in the midst of YOUR passion. Seek His direction. Wait patiently….and you too will know when to “push play” again! If a door opens…make sure to use a door stopper! Have you ever encountered a door that opened up for you right in the midst of searching or praying for one? What about a door that opened in a direction that you had never thought of going? Sometimes…God clearly opens them…just for us! If a door opens…make sure to use a door stopper! It’s important not to walk through or shut a door prematurely. Take the time to examine the source of who opened it. Carefully evaluate if it’s in your best interest before you step forward. Sometimes it only appears to be. Doors can open easily if we are too anxious and looking for ANY opportunity. And sometimes, we just want to flee our current situation. Be careful not to move too quickly, it may not be according to Gods plan. The great news is…God truly does open doors for us! He also gives us wisdom on which ones we should quickly close. The easiest way to determine what to do when a door has opened, is to use a door stopper…and pray! If you weren’t praying before the door opened, you should surely be praying when it does. You don’t want to step in a direction that is unknown, before seeking the Lord. I have walked through opened doors in my past without using a door stopper. I was anxiously looking for the next best thing, or an answer to something, but I wasn’t seeking the Lord in my current circumstance. Those are the doors that I can look back on now, and see where I stumbled. I fell through them unprepared and without evaluating what was ahead of me. I just jumped through…ready for whatever was next. And what was next…took me in directions and places I shouldn’t have been. I am there once again…A door has recently crept open for me. I hadn’t been praying for this one. So, I have used a door stopper. I am praying and searching again now, for His direction. He has never failed me. I’m pretty sure I’ll know when and how to step, as long as I continue to seek Him. Is there a door you need opened in your current situation? Have you been praying for God’s direction? If not, I suggest you seek Him first. And then, use a door stopper before you walk through. I guarantee that your greatest life moments, will be through the doors that He has prepared for you! Thank you for planning and preparing for me so tenderly before you ever even met me. Thank you for showing me “my first love” starting with my very first breath. Thank you for letting me be creative, explore the world around me and grow into my own little person. And thank you for shielding me from things that could have harmed me and for introducing me to Jesus. Thank you for laughing, playing and encouraging me to always look at the positive in a very negative world we live in. Thank you for teaching me, encouraging me and pointing me in the right direction when things were not always clear. Thank you for including God in everything and helping me to put Him first in my life. And thank you for showing me the importance of family, commitments, honesty, and integrity. Thank you for always believing in me, even through the times that I have failed you and I have doubted myself. Thank you for praying, trusting God and keeping your faith, through your own storms. You have set a wonderful example of perseverance to follow. Thank you for loving my husband, encouraging my children, and supporting our family like you do. Your love has beautifully multiplied over the years. And thank you for being there for me, (distance isn’t as hard) because you have always made yourself available no matter what. Thank you for all of the silly, singing, dancing, laughing till we cry, or crying until we laugh moments that we’ve shared. Thank you for lifting me up when i’ve fallen, for speaking wisdom from your heart and for sharing the word of God into my spirit. Thank you for understanding the importance of “our time” together. Over the years, we have experienced many irreplaceable moments together because of this. And thank you for being a person without judgement, a friend without drama and a consistent, confidential shoulder to lean on. I’m so thankful God made YOU for ME! Have you ever been in the middle of a storm? With it raging all around you? Where there is no clarity or feelings of peace? I have. And guess what? It’s been more than once, even more than twice. Let’s just say, I’ve experienced my share of storms…and so will you. Sometimes the storms we face come on fast and strong, then seem to quickly pass and fade away. When things clear up, our outlook on life is often brighter and we have learned something from our storm to use in our future. Just be careful not to hang onto that last drop of rain, doubting that the storm has really ended or never learning anything from it. Then at other times, the storm we are in the midst of, intensifies over a period of time and reaches a climax that seems unbearable to us. As the winds howl and things continue to pour down, we can completely loose our focus and even our footing. We try to make sense of our waves of emotions and we rely too much on ourselves to weather the storm out. Whether it’s a thunder storm that we’ve anticipated and been able to plan for, or the dreaded torrential down pouring that happens without warning in our life…our God remains the same and He has the power to calm all of them! Our anchor has to be secured through Him alone. 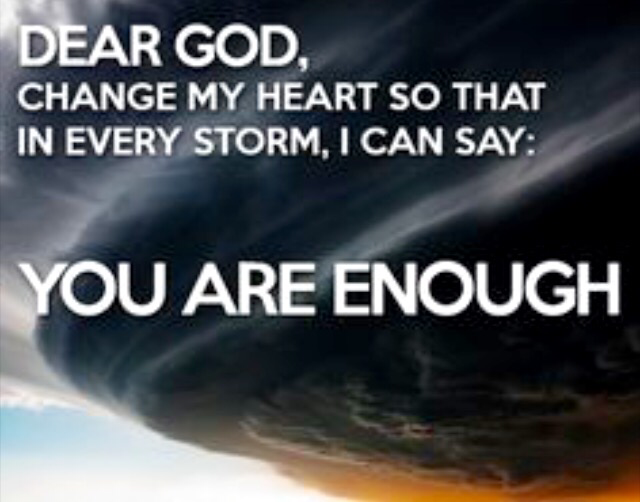 If you happen to be in any kind of storm right now (big or little) Remember, that He is the only anchor that will hold. He is sure, certain and safe. 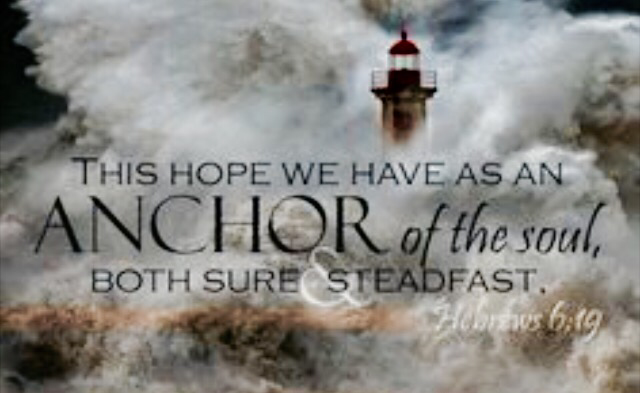 He (our anchor and our hope) is steadfast, firm and reliable. It is not in our own confidence that anchors our soul, but the sure reality and belief that Gods promises for us are true. This is our anchor. And this is what we are to lay hold of when our feet may begin to stumble or wander within our storm. When we put our trust in Christ, our eternal hope, we can make it through any storm that may come our way. How do we lay hold of something, when we are drenched in the middle of uncertainty? I too am practicing this…but here are 5 things that have helped me in the midst of the many storms I have faced and am still learning from. 1. Read your bible! You have to know without certainty that your hope is in the eternal presence of God. 2. Pray! Ask God to open your mind and heart to hope in Him alone. 4. Praise Him throughout the storm no matter what. Give Him praise for His Faithfulness, Strength, Wisdom, Mercy and Grace. 5. Think about other Christians (family & friends) who have weathered their storms holding onto their hope in Jesus. Lift up and encourage others. Share your testimony of faithfulness during and after your own storms. I’m sitting here thinking…reflecting…praying for each one of you. I’m thankful for each one of you and who each of you are. Each of you are special in your own unique way. As I reflect…I can’t help but think of your losses, your goals, your accomplishments, your struggles, your hurts, your gifts and your talents. Some of these things about you I know very well and some of these things I can really only wonder…and pray for you! I want you to know you each bring me happiness. You make me laugh and just thinking about you makes me smile. There’s not one thing you could do, that would stop me from wanting the best for you. I love to see you, to hear from you, to catch up, read posts, share pictures and to share life’s moments with you. (the good and the bad) I am thankful God gave me each of you and I will never hold the title of being your “Aunt” lightly. It really is a title that brings me great joy! Life can fail you, friends will hurt you, loss can consume you and pain can be way too real. But…You are never alone! He is greater than all of lifes messes and He will direct you always…as you seek Him. I know too well through my own mistakes and struggles that He is the only answer to life’s problems, and He is the only one to fill an empty void that maybe present. Trust Him. I pray the Lord blesses you and that each of your lives bring Him glory. That you are a light to others in this dark world and a reflector of His love to all those you meet. I pray you have strength to face each day, because some are much harder than others. That you live life to the fullest, enjoying the people in life, that surround you. I pray you are wise in your choices and a positive influence on the road that you walk. I ask the Lord to protect you daily, provide peace when needed, give courage when necessary and multiply your gifts and talents. May you seek His presence often, live by His truth, grow in your faith and personally experience His saving grace. And I pray to be here for you…to the very best of my ability…pointing you to the one… who will never leave you or forsake you and has the perfect plan for your lives!